During the “Original 6” era coaches tried a number of tactics to get the most out of their teams: soothsayers, special diets, oxygen on the bench, magic elixirs, pyramid power, and even hypnosis. 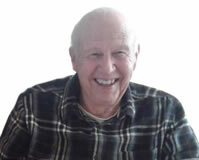 The last was a desperation move by Frank Boucher with his New York Rangers during the 1950-51 campaign. Previous to a match with the Bruins he engaged Dr. David Tracey to put his players “under a spell” in hopes they would find a winning formula. It didn’t work! They lost 4-3, and Dr. Tracey didn’t get a second chance. The “Old Lamplighter’s” reply was blunt and to the point: “They’re already asleep now!” End of sales pitch! As far as he was concerned they were operating in a fog already. But over the years professional hockey teams have faced literal fog in the arenas in which they attempted to play. The earliest mention of these 60 misty moments took place in Seattle on February 15, 1916. The PCHA match between the Victoria Aristocrats and Portland was played on this neutral site. After two periods with the score knotted a 4-4, referee Mickey Ion called the game off due to the dense fog which had invaded the arena. The contest was replayed the following evening in the same location, with Victoria winning 5-2. The arena was filled with fog so dense that players could not see their counterparts at the other side, let alone distinguish friend from foe. Skaters had to get within 10 feet of a teammate before he knew it was safe to pass the puck. Defensemen almost had to shout “who goes there?” before tackling the man skating toward them. Neither Jack Adams, the Wing’s mentor, nor Frank Foyston, the Olympics’ bench boss, indicated they wanted to call the farce off. “It should fit their men if they ever had to play a game in old London (England)”, was suggested. October 1947 was not a good month when it came to weather ideally suited for hockey games. The week leading up the Canadian Thanksgiving was especially bad. Two of Montreal’s home games demonstrated that is spades. With Rangers visiting on 16th, it was noted that the temperatures were so mild outside—conversely in the arena—that spectators came with no hats or coats, sitting in the seats in their shirtsleeves. It was so warm that condensation covered the ice, making it difficult for skaters to work out their plays. The visitors actually won the game, but the Hab’s goalie, Bill Durnan, was probably a little more than peeved at the weather man. On the last tally he had no chance to block the shot. He didn’t even move. Tony Leswick’s blast was lightning fast—right into the fog which covered the ice in front of the befuddled Canadien’s netminder. The Oct. 22 issue of the Hockey News reported both the AHL and the NHL had been plagued by temperatures in the high 70’s and 80’s (°F). Not only did it put a strain on ice-making equipment, but inside the rinks heavy mist continued to develop. The weekend of the 18th caused the NHL grief, but a week earlier two AHL matches had to be halted due to the fog. Games in Washington and Springfield had to halted and re-scheduled. The Blackhawks were visitors at the Montreal Forum. The ventilation system wasn’t able to keep ahead of the mist which formed on the ice surface. 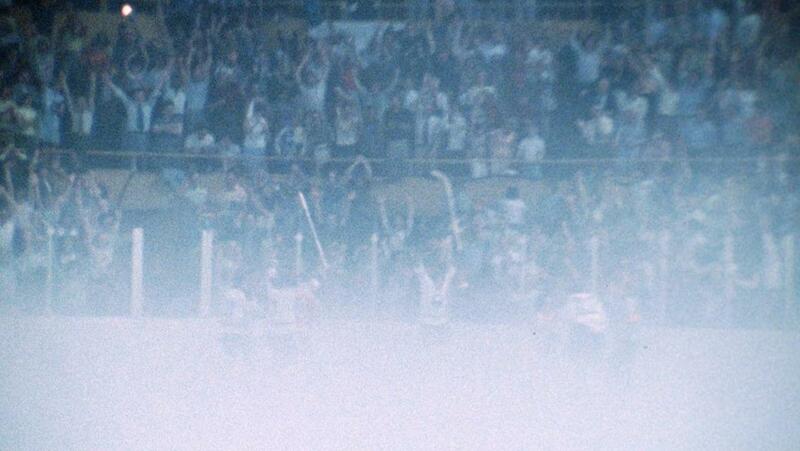 In Montreal players skated around waving their arms and sticks trying to cut through the “Scotch mist”. The game was stopped a number of times by referee George Gravel, who directed the maintenance staff to open the doors at both ends in an attempt to make the steam disappear. The Habs seem to do better in the “pea soup” and prevailed 4-2. Conditions were very similar in Maple Leaf Gardens, where the Red Wings came to challenge the Leafs. The Toronto Star reported that it was “doubtful anything could have converted this game into more than it was. Heat and humidity created a mist which hung over the ice at each end during the third period”. A little over a year later the same inclimate conditions prevailed—for at least one night—particularly in Beantown. On November 10, 1948 the Red Wings were visitors at Boston Garden. Play started on time, but after only nine minutes officials called a halt to the action. Conditions on the playing surface were so bad it was actually dangerous to compete anymore. Fog inside the arena rose from the ice surface. The pea-soup mist was so dense that no one could not see well enough to skate around. Referee Bill Chadwick called a temporary halt to action to see if conditions might improve. Instead they worsened. An attempt was made to contact President Clarence Campbell for permission to postpone the match—but he could not be reached. So, the referee, in concert with team owners postponed the contest until the next evening. The Motor City sextet, who finished first that season, must have remained “in a fog”, losing to the home-town gang, 4-1. As near as it can be determined around 1950 the New York Rangers and Boston Bruins faced off in an exhibition game in New Haven, some 700 miles (1100 km) from the site of the former hassle. It was early September, and heat dominated inside the arena. The resulting fog was sometimes so thick that it blocked the fan’s view of the players going about their business. Time and time again the referee called time-out to have the players skate around the perimeter in an attempt to disperse the mist. “Gump” Worsley, always ready for a gag, took this opportunity to display his sense of humour. Doubtless because Port Perry was home to John Ross Roach that small town was favoured to host an exhibition game just previous to the start of the 1954-55 campaign. Unseasonably warm weather created a four-foot deep blanket of fog in the smallish rink. The breath of1800 fans crowding in to see their favourites didn’t help. One journalist jokingly suggested the spectators thought the players had passed away and were playing in Heaven. All they could see of the competitors was their torsos—when they could see them at all. The best the arena staff could do was turn on huge fans between periods, hoping to clear the mist away. Commenting on the danger in which the goaltenders—Lumley for Toronto, and Ed Chadwick for the farm team, Pittsburgh—found themselves, “King” Clancy opined they deserved the purple heart medal for bravery under fire. Chadwick commented that he was “playing by ear”—he could hear the play but not see it until the attackers were only five feet in front of him. A couple of shots he didn’t see hit the boards behind him and he “nearly jumped out of his uniform”. The Red Wings seemed to have been constant victims of this annoying phenomenon, because on October 6, 1955, the old Olympia responded negatively to unusually balmy autumn weather again. The thermometer indicated 80 degrees (°F) and the humidity was rampant. Always present, and varying in intensity, fog swirled around the playing surface. In the stands spectators shed their jackets—on the ice the players lost their perspective. Referee Jack Mehlenbacher lost sight of the puck totally a few times and whistled play dead so he could regain his bearings. Chicago goalie, All Rollins, was having to play “by radar” most of the time. Once, however, he wrapped his stick on the ice until the official halted action. “Is there really a puck out there in the fog where they’re all rushing around?” he asked. Surprisingly the game was not permanently stopped. The Blackhawks prevailed by a 3-2 score! Exhibition games, naturally, are featured in the early autumn, preparing NHL teams for schedules normally commencing in early October. Mild weather often prevails. Once more that scenario fostered a fog game in a familiar location that same year. Once more the Rangers and Bruins faced off in New Haven for a pre-season tilt. Typically, the mist limited visibility to a few yards (metres). They didn’t call Boston’s Leo Labine “the Magnificent Screwball” for nothing. With his team icing six skaters for the final two minutes of the match, Leo imitated “Gump” Worsley, slipping off the bench unnoticed and hiding behind the empty net, just vacated by Don Simmons. There he waited ready to stop any New York shots. Fans roared with laughter at his antics, while officials and players at the other end wondered what was going on behind the curtain of fog. Four years later, on September 28, 1959, the Maple Leafs were getting the kinks out of their legs (and their game), visiting St. Thomas and the AHL Cleveland Barons who were training there. The rink housed 3,046 standing-room-only fans, watching Toronto whip the Ohio-based contingent 6-1. The game was a treat for spectators until midway through the second frame and the game. At that point fog began to form on the ice surface. The final 20 minutes was a disaster for both spectators and players—particularly the netminders. Players kept disappearing in the steamy atmosphere. And when they did turn up, it was at either end where the fog was most dense—and it was the goalies who suddenly faced them. One reporter called it an “untenable” situation for them. The most celebrated of incidents of this kind took place 13 years apart—the first on May 20, 1975. The Buffalo Sabres were hosting the defending Stanley Cup champions, the Philadelphia Flyers, for game three. It is an understatement to suggest they were given an unusually warm reception. The high temperature that day in the city was 82 °F; and that figure was amplified inside the Auditorium—90 °F. With nearly 16,000 excited fans breathing heavily as they watched the game action, the humidity grew—and fog began to form on the playing surface. With no air conditioning in the vintage arena, the mist just rose a little higher all the time. Sometimes fans could only see skaters from the waste up—sometimes not at all. Play was stopped five times during regulation time—and seven times during overtime . Amazingly, the extra 20 minutes almost resulted in a continuing deadlock. But at 18:29, Rene Robert just fired the puck in the general direction of the Flyer’s net—a shot that Bernie Parent never saw. As bizarre as this spectacle was, it was overshadowed by a bat. The little critter flew down from the rafters to “cooler” climes—and was rewarded with a home-run hit by the Sabre’s Jim Lorentz—which ended his foray permanently. It earned the forward a new nickname, “Batman”, and prompted an uprising by Animal Rights groups. While the above match has been unofficially christened ‘The Fog Game”, game four of the 1988 final, which pitted the Oilers against the Bruins, also went into the hockey archives. Edmonton led the round, with Boston Garden to be the site of the next game. A heavy mist formed during the early stages of the match—the result of freaky warm weather in New England. But another complication arose. The lights went out in the old arena with 3:23 left in the second frame. The only lights still burning were in the corridor exits. Soon the stands were empty. By the time power was restored, it was too late. The game would be replayed after all other games were completed. But that was unnecessary—Edmonton finished the series at home. Doubtless there have been other instances of “playing in a fog”. On April 13, 2006 the Junior London Knights faced off against the Owen Sound Attack in the Harry Lumley Bayshore Community Centre. As the game progressed fog began to roll in, making it almost impossible for players to see goalies in the opposition zones. A new wrinkle which was never an issue in the eras previously mentioned—helmet visors steaming up—became a constant problem. Half way through the third period London Coach Dale Hunter urged the referee to call the action. The Attack’s bench boss didn’t agree it was that dangerous to continue. Besides, it gave the Knights a chance to rest. London had the game well in hand at that point. One of the most recent steamy scenario-making headlines took place on October 16, 2015. The AHL’s San Diego Gulls were hosts to the Grand Rapids Griffins. The visitors won 4-2, but it was struggle just to get the game completed. Again, unseasonably mild temperatures was the perfect atmosphere for a perpetual haze to shroud the ice surface. The lower 90’s (°F) outside translated into fog inside the Valley View Casino Center. Players constantly wiped their visors. It was a chore to locate the puck, or find and distinguish the identity of the skaters. Sometimes the mist lifted—other times it seemed worse. It was hard to see the net from the blueline—prompting a lot of long shots--which flew with a wish they were on target. It was discussed about calling the game. But since the fog kept lifting from time to time, they continued the frustrating challenge. It is unthinkable that in today’s multi-million-dollar arenas, with their state of the art ventilation and air conditioning systems, the aforementioned conundrums could be repeated. Not only NHL venues, but in many minor league rinks, such frustrations are prevented from happening. But somewhere, sometime, in a small-town ice palace, during early or late-season games, unseasonal balmy breezes may create conditions ideal for fog to have its way at crucial moments. Frustrated spectators, sight-challenged referees, blind-sided skaters, and (to borrow the terminology applied to Al Rollin’s experience), goalies defending “by radar”, will curse the uncooperative, defiant, sauna conditions which can make Canada’s National Sport as difficult to handle as quick sliver.